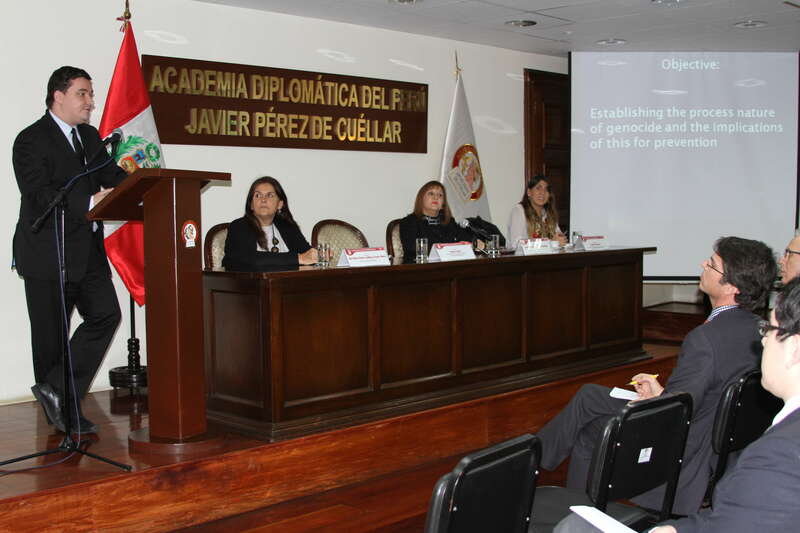 NEW YORK, September 3, 2013 – On August 19, 2013, AIPR Executive Director Tibi Galis and Latin America Program Director Eugenia Carbone visited the Javier Perez de Cuellar Diplomatic Academy of Peru , an education and training center for Peru’s Ministry of Foreign Affairs. Galis delivered a lecture on the process of genocide prevention and introduced attendees to the Latin American Network for Genocide and Mass Atrocity Prevention . In his remarks, Galis outlined the eight stages of genocide and highlighted the importance of implementing preventive policies in the domestic, regional and international arenas. The Latin American Network for Genocide and Mass Atrocity, he said, was created as an educational resource to develop cooperation on policies that build capacity to prevent genocide and mass atrocities. In addition to students from the Diplomatic Academy, the Honorable Romanian Charge d’Affaires, Mr. Stefan Nicolae, and the Human Rights Director of the Foreign Ministry, Minister Ana Rosa Valdivieso SDR, attended the conference. Click here to see additional images from the event.